John's Labour blog: "Government to respond to petition challenging LGPS investment reforms"
"Government to respond to petition challenging LGPS investment reforms"
"More than 10,000 people have signed a parliamentary petition launched by Unison to examine proposed changes to the Local Government Pension Scheme (LGPS) investment regulations. The union has been challenging some of the government's proposals which it is concerned could lead to ministers telling the LGPS to invest in UK infrastructure projects. The government is keen for the LGPS to increase investment in UK infrastructure, given just 1% of the scheme's total assets is allocated to the asset class. It hopes that pooling the scheme's 89 funds will help achieve this, as well as changes to the current investment regulations that restrict how much can be invested in infrastructure. Who controls the LGPS: members or the government? 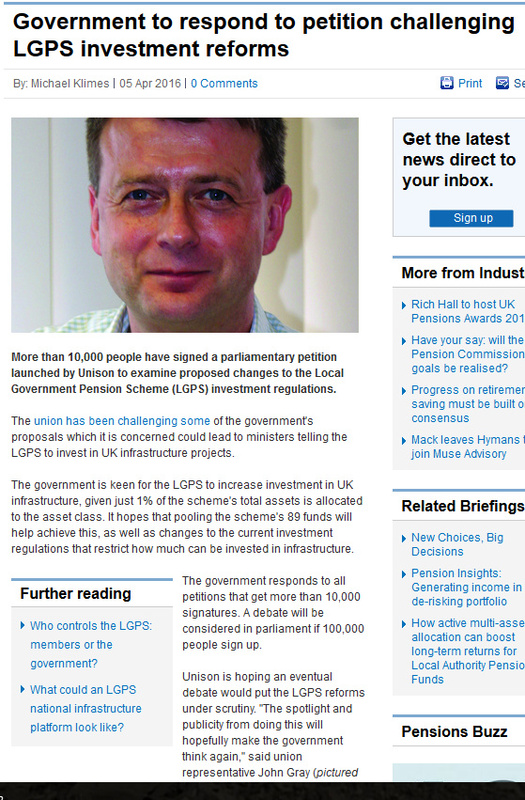 What could an LGPS national infrastructure platform look like? The government responds to all petitions that get more than 10,000 signatures. A debate will be considered in parliament if 100,000 people sign up. Unison is hoping an eventual debate would put the LGPS reforms under scrutiny. "The spotlight and publicity from doing this will hopefully make the government think again," said union representative John Gray (pictured above). "What the government is proposing is unlawful. We know what happens when people make investment decisions based on political pressures. Osborne seems to think the LGPS is some sort of British sovereign wealth fund. It is not. It is there to pay pensions." First Actuarial partner Rob Hammond who agreed with some of Unison's points said: "It would be unhelpful if there was something so prescriptive from government as to how schemes should invest." A consultation on the proposed changes to investment regulation ended in February, where several bodies warned they would give too much power to the government. In the past Unison has argued the government's reform agenda contradicts European pension law. Unlike private sector schemes, the LGPS is not subject to the Institutions for Occupational Retirement Provision (IORP) as the government has used a get-out clause allowing a pension fund to be exempt from certain parts of the directive where benefits are guaranteed by the public authority. Unison has argued for years that this exemption is wrong and that LGPS must comply with IORP. The directive says member states must not subject investment decisions of institution or manager to any prior approval or system notification".